Taking a show about the war on drugs to Bolivia seemed like risky business but was far more sensible than recent U.S.-Bolivian diplomacy. John Malpede has never worried much about transgressing the line between brave and crazy. Otherwise, he would not have started a theater company in Skid Row Los Angeles in the mid-1980s, when few services existed there, and most people, including his own theater members, predicted the idea would never fly. Nor would he have thought it a cool idea to join members of his L.A. troupe with Bolivian actors this August to tour Bolivia—where coca is a major cash crop—with a play about the War on Drugs. That notion seems an especially quixotic idea at this moment, as relations between the United States and Bolivia have reached a nasty pass, largely because of drug issues. Evo Morales, the president of Bolivia, also heads the Federation of Coca Growers. Morales often pleads the case for coca—as he did at the United Nations—as a plant of traditional importance in Bolivian culture that has been unjustly vilified. He and other Bolivians like to stress the difference between coca and the drug cocaine, first synthesized from coca by a nineteenth-century European chemist. Bolivians compare themselves to the French who grow grapes: they can’t really be blamed for the alcoholics who abuse wine. The Bush administration faulted Morales for failing to curb coca production or deter the manufacture of cocaine. Morales accused the United States of meddling in Bolivian affairs and plotting with his political enemies to overthrow his government. The countries expelled each other’s ambassadors. Citing lack of drug enforcement cooperation, the United States ended its preferential trade terms with Bolivia. In retaliation, Bolivia threw out U.S. government employees, including the Drug Enforcement Administration (DEA) and the Peace Corps. Some Bolivian and U.S. officials have expressed a cautious optimism that relations between the two countries may improve in the Obama era. But Morales has accused the United States of complicity in the recent Honduras military coup. Emotions remain raw and official relations, tense. So John Malpede wondered if touring a play about the Drug War along the front lines of that war might stimulate more constructive dialogue about drugs and drug policies than the two governments have thus far managed. Would Americans who had been affected by drugs and anti-drug sanctions find common ground with Bolivians who live where coca has long grown, but where cocaine use is also a growing problem? As the foreign actors would find out, the war on drugs has claimed many victims in Bolivia as well. Members of the Malpede’s Skid Row theater troupe, the Los Angeles Poverty Department (LAPD), landed in mid-July at El Alto airport, one of the world’s highest, at 13,000 feet, near Bolivia’s capital, La Paz. Coming from sea level in Los Angeles, Tony Parker felt dizzy and short of breath. After quaffing some coca tea, the local remedy for altitude sickness, Tony was soon all right again. But LAPD member Kevin Michael Key, a recovering cocaine addict, refused the tea, though his doctor had assured him that coca does not possess the addictive properties of the drug made from it. Kevin ordered up some oxygen instead, which the airport keeps stocked for afflicted visitors. Malpede and his wife, Henriette Brouwers, had less trouble adjusting to the thin altiplano atmosphere above La Paz. They had just arrived from Huancayo, Peru, visiting the family of Nilo Berrocal. Nilo grew up in Peru, but emigrated to Holland, where he has lived and worked for more than twenty years, as a theater director in Utrecht. Part of Nilo’s task was to bring other cast members up to speed in the language, since the drug war play—Agents & Assets—was being staged for the first time ever in Spanish. John Malpede started the LAPD (whose initials mock the police force that harassed many of their members) in 1985. A rising theater performer of national reputation, Malpede took a detour from his personal career to share his theatrical knowledge with the homeless and formerly homeless denizens of Skid Row, the poorest section of Los Angeles. Branded as losers and welfare cheats by the Reagan administration, residents of Skid Row had no voice in their own destinies. Malpede empowered some of them with theatrical skills, enabling them to communicate their dilemmas publicly and powerfully. Over decades, the group has become increasingly articulate and sophisticated, gathering information from other poor communities in the United States and beyond, making connections among poverty, globalization, and militarization. LAPD members know how the drug war profits a few and victimizes many. Malpede wrote the playscript, Agents & Assets, based on a 1998 U.S. Congressional hearing. The House Intelligence Committee was looking into allegations of CIA complicity in the smuggling and dealing of crack cocaine in the United States by agents of the anti-government forces in Nicaragua, known as the Contras. Backed by the Reagan administration, the Contras fought against the democratically elected, leftist Sandinista government of Nicaragua. Reagan called the Contras “freedom fighters,” but Congress denied them U.S. funding. So the Contras turned to drug smuggling to fund their anti-Sandinista military actions, with the acquiescence of the CIA and White House shadow operative Oliver North, who permitted and abetted the Contra drug operation. As journalist Gary Webb detailed in an explosive 1996 newspaper series, “Dark Alliance,” (which, in 1999, became a book) the CIA enabled huge shipments of cocaine to enter the United States to raise money for the Contras. As the play shows, in 1998 CIA Inspector General Frederick Hitz denied and obfuscated the CIA’s connection to Contra drug smuggling. And, in 2009, as the play toured Bolivia, the Agency finally released a highly redacted 2004 CIA Inspector General’s report about CIA torture techniques. Ironically, some of the same players were involved in both real life and dramatized episodes. Porter Goss, for instance, chairman of the hearing depicted by the LAPD, played down the allegations of CIA-Contra malfeasance. Later Goss, as CIA director under George W. Bush, lobbied for keeping the 2004 torture report secret, to avoid damaging U.S. reputation and CIA morale. The dramatized 1998 Congressional hearing reveals the hypocrisy of lawmakers who decry illegal drugs, even as they, in attempts to abet an illegal war, refuse to sanction the CIA for enabling millions of Americans to become cocaine addicts. Malpede edited the hearing transcript for length and clarity, but did not change a word of it. LAPD actors and others, who play committee members and the CIA inspector general called to testify, are men and women who have been personally affected by illegal drugs and the “war” against them. Some have suffered addiction and/or incarceration. By speaking the very words of deceitful lawmakers who permit this systemic abuse, the actors bear witness against them. Agents & Assets began its long run of performances during the uncertain post-presidential election period of 2000, touring many cities throughout the United States. The “second act” of the show is a discussion, led by a moderator and a couple of speakers, who relate current and/or local issues to the themes of the play. So each performance is a unique event. With different drug reform laws up for votes in various states, the show revealed its political potency. Agents & Assets also proved relevant in Utrecht, a Dutch city that suffers its own intransigent problems with drugs and drug laws. For its South American premiere, the Spanish-language version of the play was titled Agentes y Activos. Malpede and Brouwers found congenial Bolivian artistic partners in Wiler Vidaurre and his wife, Zulma, who are professional actors onstage and in films. They run a school of “Artes y Talentos” in Cochabamba. The couple came to Malpede’s attention because of an innovative theater program they have run in local prisons for the past eight years. Many of their prisoner-performers, incarcerated under the local anti-drug law 1008, have “graduated” to parole or to full liberty outside their jails, thanks in part to the rehabilitative aspects of their theater experiences. It was important to John Malpede and Wiler Vidaurre to feature Bolivians—who, like their fellow players from Los Angeles, have felt the impact of their country’s drug policies—playing bureaucrats. Wiler had a couple of actors in mind for parts in the play, but one of them was still on restricted parole, only being allowed out of prison during the day to work, and having to return to his cell each night. Wiler appealed to a judge he knew from this prison work to let this actor rehearse in the evenings and travel when the group took the show on the road. The judge, Yolanda Ramirez, who is responsible for supervising about 2,000 prisoners in various stages of incarceration or parole, decided to see the group for herself. She came to the first rehearsal, met the visiting gringo artists, and talked with them about the play. Yolanda told them she had some theatrical training herself, and asked if she too might join the cast. When she read the part of one of the more indignant members of the Congressional Committee—Juanita Millinder-McDonald of California—she found a sympathetic point of view. So Agentes y Activos featured a convicted felon in its cast, as well as a judge who sentenced and supervised convicted felons. In the many incarnations of the show, this was a first. The linguistic obstacles to this project were almost as formidable as the political ones. Several of the foreigners barely spoke Spanish, and had to learn their parts phonetically. And so, every morning, Nilo tutored the foreign actors in Spanish. Every night, the combined cast of foreigners and Bolivians rehearsed the play. The language of the play was also tricky to decode. Legislators tend to converse in a demagogic doublespeak, which audiences must first comprehend in order to see through and discount. The point is to grasp the evasions and outright lies beneath the polite, empty rhetoric and parliamentary niceties, which morph, as the hearing progresses, into grotesque absurdities that would be comic but for their real-world consequences. The devil is in the details of this discourse, full of sound and fury, signifying, sometimes much less; sometimes even the opposite, of what is actually said. Layers of meaning in the play might have disappeared or become muddled in translation. Fortunately, Bolivian culture, despite its low literacy rate, is exceptionally eloquent. 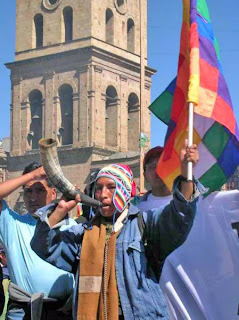 Ordinary Bolivians, despite a lack of education, are often articulate public speakers. Americans tend to hem and haw in public; Bolivians can speak cogently at length, because they have learned to enunciate their needs clearly out loud, in order to reach a community consensus. As a society of practiced public speakers, Bolivians are able to spot the hypocrisy beneath the bombast of public rhetoric. The performance space was the brick-and-glass pentagonal Roman Catholic chapel. Large religious paintings festoon the chapel walls, between large windows. Behind the altar is a huge, floor-to-ceiling triptych of Christ, risen and joyous and nearly naked, below God the Father, with arms outstretched and flanked by adoring angels. The long, cloth-covered hearing table with pitchers and water glasses, name plates and eleven chairs, backed by a dozen American flags, set before the garish altar, resembled its own sort of Last Supper. Hundreds of men filled up the four-tiered bleachers to see the show, and at least a dozen kids, whose shrieks and eruptions punctuated the cavernous acoustics. Someone asked him whether there was any difference between the people in prison in Bolivia and the United States. Kevin said, “They’re the same, mostly poor, working-class folks.” Someone else asked, “If the United States wants to eradicate illegal drugs, but most illegal drug users are there, what are they really doing?” That question hung in the air and still does. After rehearsals and performances in Cochabamba, the show played the Bolivian cities of Oruro, La Paz, El Alto, Sucre, and Santa Cruz. Questions and comments in every city reflected the intense emotions that the issues of the play raise about the drug war, notions of justice, and international relations. Bolivian historian, activist, and ex-government official Rafael Puente told audiences in Cochabamba that events in the play might seem remote, but similar things were happening here in Bolivia at the same time. In 1980, the CIA enabled the violent “narco golpe de estado” (drug coup) of General Luis Garcia Meza. As Puente noted, former DEA agent Michael Levine recounted these events in his book, The Big White Lie. In 1980, ex-Gestapo honcho Klaus Barbie emerged from his Bolivian hiding place to oversee the arbitrary arrests, torture, and disappearances of the narco dictator García Meza’s political opponents. Cocaine exports reportedly totaled US$850 million in the 1980-81 period of the Meza regime, twice the value of official government exports. Puente described the huge CIA cocaine processing plant at Huanchaka, in eastern Bolivia, where the drugs were produced to help finance this repressive regime. A Bolivian man asked whether things will change under Obama. John Malpede opined that “Changing drug policy is not a high priority for Obama. Changes in drug policy have to come from communities or states in defiance of federal law, to reduce penalties and put treatment in place of jail time.” Malpede’s tag line for the show, that “The war on drugs imposes a military solution on a social and public health issue,” was widely printed in the Bolivian press. Bolivians have their own repressive drug war in place, thanks in large part to Law 1008, passed in 1988 under intense pressure from the United States. Anyone accused of drug violations, under what one former law school dean calls “this inhumane law,” loses basic human rights, such as the presumption of innocence, the safeguards against self-incrimination, the right to a defense, or to an impartial judge, or to due process, or to a speedy trial. Law 1008 expands the definition of “trafficking” to mean “to produce, possess, keep, store, transport, deliver, administer or give as a gift.” Judges routinely hand out harsh sentences—since an accusation is tantamount to a judgment of guilt—and they fear public outrage for giving lesser punishments. Law 1008 rewards denuncias or snitches. These snitches often turn people in for the reward money, or for grudges unrelated to drugs. Police routinely resort to torture to extricate confessions from the accused. Such forced confessions are all that is needed for proof of guilt in Bolivian judicial proceedings. In its book, The Weight of Law 1008 (1996), the Andean Information Network compiled heartbreaking narratives of poor, illiterate Bolivians hounded into prison because they could not pay the bribes that were demanded by officials to make their cases disappear. Several of these drug war victims report being tortured under the direction of U.S. DEA agents. During the post-show panel at one of the Oruro performances, two drug officials parried questions from the audience about Bolivia’s war on drugs. Alex Alfaro, Departmental Director of the Special Police Force to Fight Drug Trafficking, said drug production was rising in Oruro. His forces have found seventeen cocaine labs in the past year. As of September 2009, the police have confiscated more than a ton of cocaine, as much as in all of 2008. Alfaro said a kilo of marijuana costs one hundred dollars (U.S.) and a kilo of cocaine, $1,200. He handed out anti-drug pamphlets, warning of dire, organic consequences from using marijuana, cocaine, tobacco, alcohol, and inhalants. Members of the audience, unaccustomed to seeing these usually invisible officials, began to ask penetrating questions. And so it went that night in Oruro, as the drug officials evaded questions and shaded their responses in ways that precisely mirrored the dynamics of Agentes y Activos, in which the CIA Inspector General dances around issues, answers questions he has not been asked, or flat-out lies about the CIA’s links to the Contra cocaine scandal. The show was not only relevant but was also being replayed immediately afterward in an updated, Bolivian mode, right out where everyone—except the officials themselves—could see it. Agentes y Activos played theaters and schools, public plazas, and even a prison. The post-show conversations showed that the real struggle is not between Bolivia, where coca grows, and the United States, where cocaine is consumed. The greater problem lies within each country, between each government and its own people. By declaring war on drugs, the United States and Bolivia have declared war on their own populations, but only against the small-time users and dealers, not the powerful few who profit most from the ongoing, proliferating traffic in illicit drugs. With the U.S. and Bolivian governments entrenched in socially self-defeating policies on drugs, John Malpede displayed courage and creativity in using theater as a way to initiate people-to-people conversations about the issue. After thirty years of the “war on drugs,” more people are in jail, and more drugs are available than ever before. It's a “phony war,” as Evo Morales has said, a cover for the United States to project a militaristic presence into foreign countries, and for authorities in countries like Bolivia to control their own people. In the sense that “illicit drugs” are a bogeyman, Agentes y Activos fits the horror genre, all the more frightening because the monster's many victims are real.